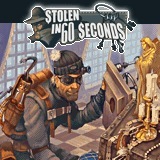 Released late last year, Herocraft's Stolen in 60 Seconds is a multi-platform, single-player only game offering a unique combination of action and strategy. 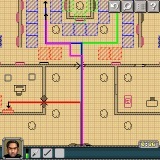 The player takes the role of the mastermind of a group of jewel thieves trying to plan and carry out increasingly complex heists on a variety of buildings. Unfortunately, this title's surprising amount of depth ends being too much for quick, casual gameplay expected by most mobile device users. In fact, this title really aims higher than not only the average mobile user but the average Palm OS device as well. The graphics and in-game text are miniscule and appear to be yet another casualty of the "one size fits none" cross-platform development plaguing the mobile gaming developer community of late, as the game features an oddball mix of lavish cinematic screens, atmospheric jazzy music and barebones in-game graphics with tiny text and icons throughout. I kept trying to get into the game by forcing myself to sit and play it diligently but somehow it just doesn't quite add up as a compelling Palm OS title. I feel this game's interesting concept of "the art of the heist" would be far better suited for the Nintendo DS' twin screens or even as a downloadable title for the larger-screened Sony PSP. Ultimately, Stolen in 60 Seconds offers a compelling premise but is ultimately hampered by mediocre execution for the constraints of mobile devices. 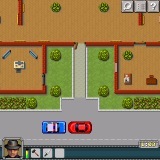 The Palm OS version of the game supports 320x320 screen resolutions as well as 320x480 and 480x320 on compatible devices. The Tapwave Zodiac 2 is also listed as a supported device but with no mention of any Zodiac-specific enhancements other than 480x320 resolution support. In addition to the Palm OS 5.0 version, the game is also available UIQ, Symbian Series 60, and Windows Mobile devices. A free trial version is included, after which the game can be purchased for $14.75 USD. Jazzy music sets an appropriate atmosphere during the briefing screens and during missions. Small sprites and the usual tiny cross-platform graphics that don't make the best use of the available resolution or screen space. Inconsistent 5-way navigator support prevents the game from being totally playable without a stylus. Some functions require removing the stylus to activate onscreen functions via tiny icons. Actual gameplay is rather minimal and becomes bland after a few rounds. 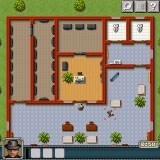 Novice or young players may have difficulty figuring out how to accomplish successful robberies due to the lack of a tutorial mode. Went to try the game thinking "I have a OS5 device". Sadly, mine isn't mentioned as supported... it's a Sony Clie TH-55. Is there any particular reason anyone can think of, generally, why I shouldn't be able to play it? If the game is written for OS5 officially & I have OS5 then I should be able to play it, right? Well, of course I can't. I had to run a Windows installer (why exactly was this necessary? ), sync it to my Palm but my Palm doesn't know what to do with the .psi file that was xferred to it.